Trap 25 prior to hiving. Last week was set to be the beginning of a new experiment. (see Latest Experiment – Attempting to use NO wire in deep foundation-less frames) That will need postponing. It appeared at hiving that Trap25 had no queen in it. I picked this box up about an hour North of my home. I caught two nice swarms at the same place last year. Normally I never move a trap unless I first see pollen entering, but being so far away I didn’t want to make two trips. I guess that was a bad idea this time. The swarm had built quite a bit of comb, and there was a lot of nectar being cured. No eggs or larvae were observed. The combs were examined closely, but I was afraid I could have missed something. As opposed to shaking the bees lose and cutting my loses they were put in two boxes. The forecast for last weekend had been calling for rain. I was hoping that I might pick up a swarm shortly after that and be able to just add it to this group. It will be a week tomorrow since Trap #25 was hived. There has been no real rain anywhere close except a very few small pop-up storms that didn’t really amount to anything. Saturday this group will be examined. If they have no queen I am planning on shaking them lose. Swarming activity has dropped off so I don’t have any full traps to add to this group. This is something that happened two or three times in 2011. I don’t know what happened to the queens or how often this occurs in swarming behavior. There really is no pattern that I have observed yet. This has happened at different sites at different times through the summer. Any ideas? Leave a comment. 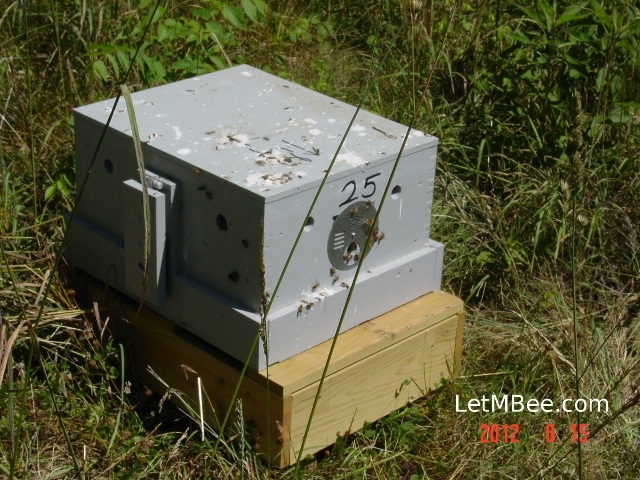 This entry was posted in Experiments, Hive Reports, Swarm Trapping and tagged bee, beekeeping, Indiana beekepeing, Jason Bruns, swarm trapping. Bookmark the permalink. It may have been a virgin swarm. The queen could have been out on a mating flight or could have died on the mating flight and never returned. I had a virgin swarm from one of my hives last year. After I caught and rehived them it took a while for the queen to start laying. That possibilty is the only reason those bees weren’t shook off the frames last week. I will be checking in on them Saturday morning. I hope that it was a virgin swarm and I see eggs and larvae. I will let you konw. Anita you were right on the money! Went back and checked what will be known as 1211 and….. FULL -O- BROOD!!! Fist good thing to happen in a while!!! Made my Saturday. Also found that though it is dry-as-a-bone most of my bees are finding something to make honey out of and A LOT of it. I have a couple of laggards, but most are making it happen. Yesterday, during a class held by the local bee whisperer, I learned it only takes 3 days to kill an entire colony from lack of food. Bees are very resourceful though. I’m glad yours are finding something to eat. It always amazes me how fast a hive can produce a mated queen when they are in swarm mode, my number 3 hive made about three swarms all of which had mated queens within a very short while, I think all that swarming happened within a month or so. I have read that at times when hives send out several swarms in rapid succession workers will recap over queen cells as queens try to emerge to keep them in. They will send out a secondary swarm, then allow the inhibited queen to emerge. 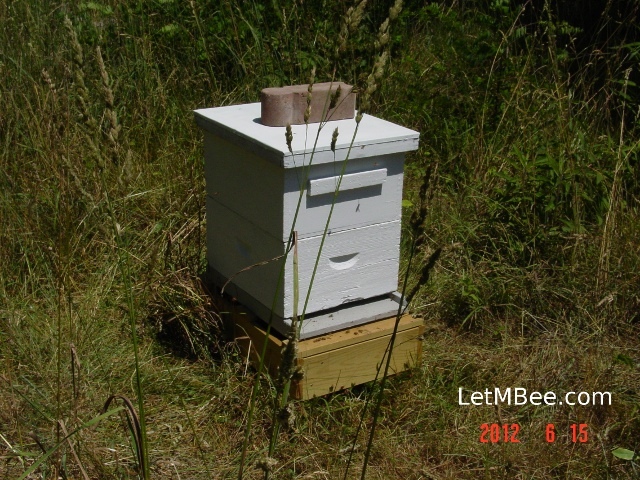 This goes against other sources that say a queen emerges and then goes and destroys remaining queen cells. I read a lot of stuff. Sometimes I am left wondering what to believe. One thing is certain though they are amazing. I’m not sure about recapping I have read that a hive can host multiple queens, I have seen something like this myself in that there were at least three queens in that last swarm I caught, one was probably mated. So if a multi queen swarm was seen this must mean that that hive had multiple queens. Gratz on your now QR hive 🙂 its the little things that make one happy.